Gold Fillings - Gold alloy fillings are extremely durable, resistant to corrosion or tarnishing and do not damage other teeth when biting. While some people prefer gold fillings to amalgam, still others prefer natural-color restorations with porcelain and composite resins. Gold fillings are durable – Gold alloy fillings can last at least 10 to 15 years. Usually they last much longer. They do not corrode or become tarnished and retain their color. In contrast, the silver color of amalgam can tarnish and discolor not just itself; it can also give a discolored look to adjoining teeth. Tough and strong - They are capable of withstanding chewing forces and resist tendency to fracture when subject to hot and cold food and high levels of pressure. Gentle on teeth – They do not cause damage to opposing teeth. Nor do they tend to chip off like composite fillings. Because they are strong, when using gold alloys for filling, dentists do not have to remove a lot of healthy tooth; unlike in the case of amalgam fillings. Gold fillings do not cause allergic reactions and are tolerated well by patients' gums and mouth tissue. Some people prefer gold fillings to silver-colored amalgam fillings. 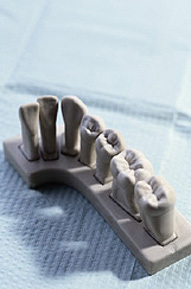 Dr. Wong is a member of the Richard V. Tucker Academy Study Clubs, which specialize in perfecting the technique of cast gold restorations. Please feel free to call our office if you are interested in this type of restoration, or just interested in learning more about it?